Three types of rules help analysts interpret an Regional Forecasting Table (RFTs). Trends. Age-structural trends are models that describe the chances of a state exhibiting a particular behavior (such as a regime type, engagement in an intra-state conflict, or attainment of a level of development) probability of a behavior continuously over the range of median ages (15 to 47 years). Trends describe the along the range of country-level median ages (15 to 47 years). Conditions. These exceptional conditions allow states to defy the latter set of trends. In other words, they identify types of “rule breakers”. Conjectures. Conjectures are preliminary hypotheses. Each is a candidate for ultimately becoming either an age-structural trend or an exceptional condition. However, each requires some degree of additional clarification and testing. From a scientific perspective, all of political demography’s rules and conditions are hypotheses. Each could fail, be modified, rejected, or displaced by a better performer after a rigorous test or fundamental change in the relationships it describes. Trend 2. 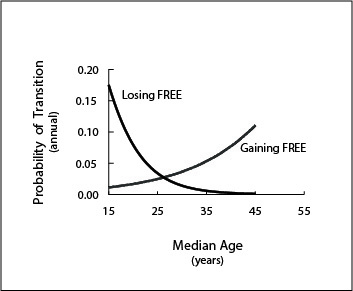 FREE states below a median age of 26 years to be prone to losing FREE (descending to assessments of PARTLY FREE or NOT FREE) within the following 10 years (Fig. 2). Trend 3. states within the youthful portion of the list (below median age of 25.5 years), or near its edge, to the most vulnerable to the outbreak of intra-state conflict. As their population nears a median age of 30 years, they should also be expected to achieve the World Bank’s upper-middle income category (see Fig. 3) and settle civil conflicts, although ethnic conflicts with youthful minorities are likely to persist or intermittently recur. Conditions. Of course, there are exceptional conditions for which to watch out. Condition 1 [Political Monopolies]. States under the control of political monopolistic regimes–single party states, like the remaining Marxist autocracies (e.g., China, North Korea, Vietnam, Cuba) or monolithic non-party states, like Iran’s theocracy, do not appear to “obey the rules.” Monopolistic regimes, particularly the most ideological of them, are difficult to dislodge. As their age structure matures, pressures to liberalize are repelled by ideologically justified suppression of dissent and intimidation. As the age structure matures, the chance for popular revolution typically declines, narrowing the possibility for reform to the emergence of a reformer within the ranks (a Gorbachev), or to external actors. Condition 2 [Revolutionaries]. Revolutionaries and other charismatic reformers (Russia’s Vladimir Putin, Venezuela’s late-president, Hugo Chavez; Singapore’s late-president, Lee Kwan Yu) who tolerate an opposition, but have a large popular following, are also difficult to dislodge. Their regimes persist as long as they remain alive, and as long as they are able to designate an equally charismatic reformer–which rarely happens. While they may tolerate a weak opposition, they rarely allow a charismatic underling to rise within their own political organization (perhaps with the exception of one of their offspring). Thus, in the long run, their regimes are ultimately prone to change as their age structure matures. Condition 3 [Small Populations]. States with relatively small populations (I use populations under 5.0 million) often over-perform. They are often “precociously” assessed as FREE, avoid intra-state conflict even as youthful populations, and often achieve the World Bank’s high-middle income category at younger median ages than more populace states (examples are: Costa Rica, Jamaica, Belize, Botswana, Guyana and the Solomon Islands). Condition 4 [Ongoing Ethnic Conflicts]. States that are involved in significant armed conflicts with ongoing ethnic conflicts or dysfunctional inter-ethnic politics often delay democratization (e.g., Colombia, Sri Lanka, Myanmar, Lebanon). Here, I control for states that have greater than 1,000 battle-related deaths per year, but it may be the case that states are sensitive to smaller conflicts. Condition 5 [Resource Rentiers]. States that rely on oil or mineral wealth may have the wealth to control dissent and placate discontent, delaying democratization (Russia, the GCC states). I control for states where oil and mineral revenues amount to more than 15 percent of GDP. Condition 6 [Military Regimes & Absolute Monarchies]. Expect states led by military authoritarians to cede rule to pro-democracy movements before the population age structure reaches the end of the intermediate phase (a median age less than 35.5 years). This constraint also appears to be true for absolute monarchies, perhaps with less certainty. The following Regional Forecasting Tables are available on this website: Middle East-North Africa (MENA); Latin America and the Caribbean (LAC); The Pacific Rim (PAC); East and Southern Africa (ESA); Central and South Asia (CSA); West and Central Africa and the Sahel (WCA); Europe (EUR). Conjectures are promising hypotheses, but need considerably more research. Conjecture 1 [Spillover Hypothesis]. 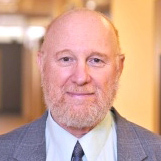 Contiguous pairs and clusters of states with youthful populations risk “spillovers”–conditions under which the insurgency involved in intra-state conflicts crosses borders, affecting adjacent states and relations between states (examples: Taliban in Pakistan and Afghanistan; ISIS in Iraq and Syria; Al Qaida, ISIS, Boko Haram in the Sahel). Conjecture 2 [Populism Hypothesis]. The coupling of age-structural maturity and immigration appears to be associated with the rise of populist political contenders and receding Freedom scores. If this hypothesis is viable, then analysts may see receding levels of Freedom Scores among post-mature states, and perhaps fewer numbers of FREE among them in the future.